Description: Its essential oil properties may help headache & congestion in several ways due to it’s aromatic properties. These may increase bronchi and help nasal passages to clear, and helps stuffed up noses for improved breathing. It can be used on sinus or other headaches. Rosemary used by European doctors for colds, coughs, flu, congestion, respiratory ailments, sinus headaches, for immune boosting, pain and inflammation. Peppermint used for upset stomach, eases motion sickness & nausea. Used in jet-lag formulas, to help clear thinking and mental fatigue. May help with headaches, relax spasm and discomfort of stiff, sore inflamed muscle, sprains & strains. It may reduce warm conditions like aches, pains and inflammation and stress headaches. Marjoram has been said to relax the body, calm the mind, ease insomnia, relive pain and spasms. It’s aromatic properties may increase bronchi and nasal passage and stuffed up noses for improved breathing,less snoring, help headache tension & headache. Lavender soothing and calming, relaxes the mind and enhances sleep & to help fatigue/stiff joints. It may help the immune can help stress headaches, aches, pain and has anti-septic qualities. Directions: It may help when rubbed on forehead, temples & sinus and under nose, to ease a stuffy nose for headache, headache tension & congestion/pain for sinus. It may help relieve pain, spasms and headache. Apply to nose opening /just under nose. On the chest for breathing. 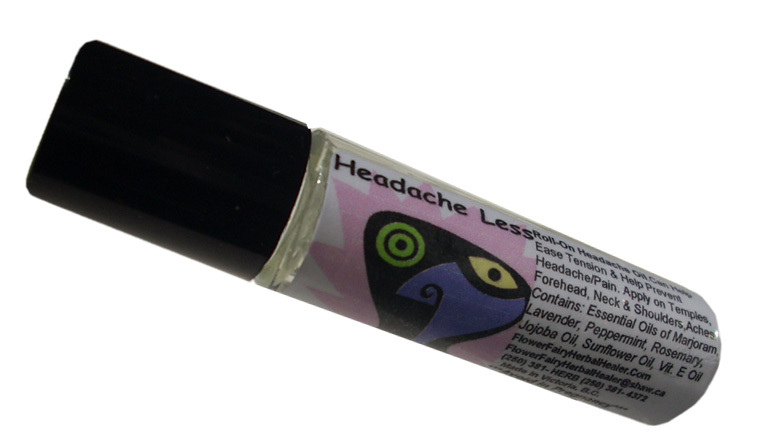 Use on neck & shoulders for tension and headache tension. Also can be inhaled from roller to clear head and nose and calm moods. It works like a chest rub also, this may help respiratory problems like bronchitis, colds and coughs and it may help with jet lag symptoms too. Avoid eyes. Contains: 100% certified organic, fair-trade, pure & natural essential oil of essential oils of Marjoram, Lavender (we use the best quality Lavender essential oil available in the world. It is 100% certified organic, fair-trade, pure & natural essential oil of Lavender from Provence), Peppermint from France, Rosemary, Jojoba oil, Sunflower oil, & natural vitamin E oil. In a clear glass bottle roll-on. Caution: It may increase drowsiness so you should avoid driving or operating equipment while using it. It also has a menstruation stimulating effect so it should be avoided in pregnancy and due to the fact it is good to avoid peppermint essential oil during pregnancy or nursing, since it may stop milk flow. Avoid getting into eyes because it may sting. Avoid rosemary essential oil if you are an individual with seizure disorders. Avoid rosemary/peppermint essential oil use if you have high blood pressure. These essential oils may cause skin irritation in those individuals with sensitive skin. If it’s tingly sensation is too much for your skin you may want to discontinue use & wipe off. You may need to go to a specialist or look at allergies if symptoms persist.